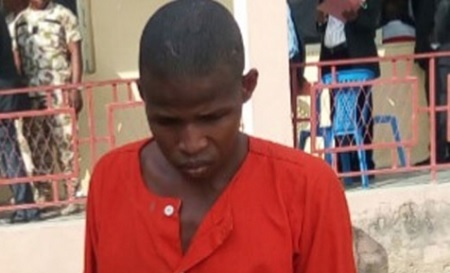 An unrepentant Boko Haram suicide bomber, Abba Umar, 22 years who doubles as a commander of the sect has bagged a sixty years jail term for his role in several operations of the group. The Federal High Court sitting at Wawa Cantonment, Kainji, Niger State, on Tuesday February 13, 2018 handed over the judgement. He confessed to be a member of the dreaded Boko Haram and a sect member of the Jama’tu ahli sunna li da’awatu wa Jihad, meaning, “people who follow the path of the Prophet for preaching and jihad”. Although Umar, a Kanuri from Shuare, Damboa Local Government Area of Borno state who spoke in Hausa language pleaded not guilty, he, however, vowed to return to Sambisa Forest if he is released to continue where he stopped. Comrade Salihu Othman Isah, Special Adviser on Media and Publicity to the Honourable Attorney General of the Federation and Minister of Justice in a statement on Wednesday and made available to newsmen reports that the insurgent’s sect commander was charged via case file no. FHC/KAINJI/CR/108/ 18- FRN VS ABBA UMAR. Count 1: 15 years imprisonment for professing to be a member of the sect. Count 2: 30 years imprisonment for attempting to bomb Govt. Day Pilot Secondary School, Gombe. Count 3: 60 years imprisonment for participating in an act of terrorism where he was found with ammunitions. Count 5: 7 years imprisonment for failing to disclose information about his sect leaders. He said the convict affirmed to have committed all the five (5) count charges preferred against him at the Federal High Court 4 sitting in Kainji, Niger State. Umar was arrested when he was 18 years old as he carried out a botched attack in 2014. On the fateful day, his mission was foiled by members of the Joint Task Force (JTF) as he drove a heavily laden Honda Odyssey Bus with explosive devices against the wall of the Government Day Pilot Secondary School, Gombe with the intention to bomb the school. He admitted all the count charges and emphasised his important role as a commander that takes instructions directly from his leader. The unremorseful sect commander claimed that he was initiated into the group by his elder brother and subsequently moved to the Sambisa Forest. He nevertheless remained adamant to his ideology despite all the efforts by the defence counsel to convince him to have a change of heart. The convict admitted to all the written and confessional statements as well as pictures tendered as exhibits before the court, confessing to leading several other attacks. The Judge, having weighed options could not but convict him on all the five count charges as the sect leader kept on pleading not guilty though he affirmed to have committed all the offences. All the years of imprisonment are to run concurrently. To avoid the convict going back to crime, the Judge said he would undergo de-radicalisation. Another convict, Mohammed Hussain also bagged 20 years imprisonment handed out by Federal High Court sitting in Kainji in a case file no FHC/KAINJI/CR/74/18-FRN VS MOHAMMED HUSSAIN. Hussain was arraigned on 3 count charge; he participated in so many attacks that led to loss of lives and properties in Maiduguri, Borno State. He also took part in the bombing of Damaturu in which lives and properties were lost, just as he was charged for being a member of Boko Haram. The defendant pleaded guilty to all the offences and was convicted and sentenced to 20 years imprisonment to run concurrently in all the three count charges with no option of fine and the jail term counts from 13th February, 2018. In an exclusive interview when he was first arraigned last October, the die-hard Boko Haram sect commander was confident that he would be fulfilled even if he dies today, because of the successful high profile attacks he has led as commander. He listed some of them to include, but not restricted to the attack of the 33 Airforce Base in Maiduguri, Giwa Army Barracks, Bama Army Barracks, Police Mobile Base in Damboa, all in Borno state as well as Damaturu Army Barracks in Yobe state. Umar who named one, Ibrahim Modu as his spiritual teacher confessed that after every successful attack, he immediately relocates to Sambisa Forest to plan a fresh operation.